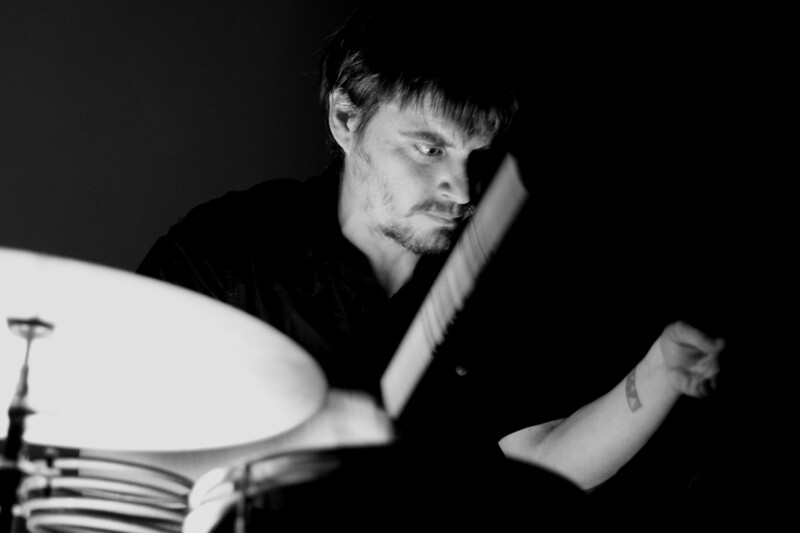 Percussionist Will Guthrie, co founder of the Make It Up Club has been living in Nantes France for the last five years or so. A regular improvisor, he is equally adept with junk percussion and contact mics as with a full blown kit, having performed with jazz, flamenco, and African bands as well as improv troupes like Anthony Pateras’ Thymolphthalien. What prompted your return to the kit? Even when I was playing more electronics I never stopped playing the drums, but when recording I rarely used the drum kit. I was a little tired and frustrated with what of I was doing with electronics, it was time to change. I also felt a need to try to bring in more ‘pulse’ elements into my music. And how have your percussive excursions over the last few years informed what you are doing on it now? You speak of wanting to play like a machine yet use the human physical limits as a way to influence where the music goes. Can you talk about this some more and were you surprised by the results? Yes, the idea for the piece ‘Breaking Bones’ was to push my physical limits, and play repeated patterns at a very high volume until the body can continue no longer, and change happens regardless of a mental decision to change. The idea is that after awhile of pushing the body the mind plays second to the body, so the results can be unexpected and different to what I would normally ‘decide’ to play. It’s almost like a chance piece, but the outside element is my own self. How did you go about recording the new album? The new album was recorded live, no overdubs or edits, one take for the first two pieces, the last track took me a little longer, but the whole thing was recorded, mixed and mastered in 2 days. You moved to France many years ago, how has this affected your playing and development? I don’t know if being in Europe has affected my playing so much, but it has defiantly given me more opportunities to play in environments where my music is well accepted, and in good conditions for my music to be played in. I saw you play with Cured Pink at the Melbourne Jazz Festival a few years back and it was one of my favourite sets of the day. Though given how unmusical the sounds he makes are I was really curious about how you’d approach it. Do remember this set and what was going through your mind? I do remember this set well, and I enjoyed it. I felt it was real ‘improvised music’ !!! As apposed to people playing in a certain ‘style’ of improvised music, be that minimal, free jazz, whatever music, this gig had a real feeling on surprise, spontaneity about it, even danger. I really enjoyed playing with Cured Pink’s very ‘un musical’ sounds, it forced me into trying to make some sort of sense out of what was he was doing. What should we expect for your show at monkey? A set maybe slightly similar the new record. This entry was posted in Interviews and tagged Sticks, Stones & Breaking Bones, Will Guthrie. Bookmark the permalink.